Master Huang Sheng Shyan 100th birthday celebration and taiji forum held in KL malaysia November 2010. “Mindful awareness is the supreme tool in training, and is the essential energy of taiji. This energy is classically known in taiji circles as ting jing or listening energy. So what is it that we listen to? Through mindfulness we direct our awareness to the knowing or listening to form, feelings, mind and phenomena. First is form or the material body. Starting with our own body in our taiji forms practice and moving on to the bodies of others in our taiji push hands practice. One directs their awareness to the knowing of the aspects of the body. Structural alignment (alignment of the 9 pearls) weight distribution, relaxation, the stretching and unstretching of the tendons and the presence and placement of the physical centre of gravity. This knowing of ones body when nurtured can be projected to knowing the bodies of others in push hands and martial practice. The mind controls and directs the physical body so there is a mind body connection. Most so called internal arts stop at this level of refined awareness of the body led by mental intent. Second is mindfulness of feelings, it is at this stage that we work with the chi or fine material energy. The chi is most easily perceived through feelings and this path of practice helps one to bypass the common pitfall of relying on imagination and visualization of the internal energy as this can quickly become a fabricated fantasy rather than a direct knowing of reality in the present. The student trains in mindfulness of the feeling of the chi as it moves up and down the body or is projected from the body through intent. It is from this relationship between mindful awareness, feelings and body that the saying “mind leads chi, chi leads body” finds its meaning. Moving waves of relaxation through the body with the intent moves the chi through the body, the relaxation acts as a pump to move the chi and makes the body more sensitive to the feeling of the chi, the deeper ones ability to relax the higher the potential for the movement and cultivation of the internal energy. Once again this process starts within oneself and progresses to encompass ones training partner as well. Master Feng’s system of Chan Szu Chin exercises is derived from the Chen family style of Taiji, taught to him by Master Chen Fake in Beijing, China, and from his Xin Yi lio He Quan background with Master Hu Yao Zhen. 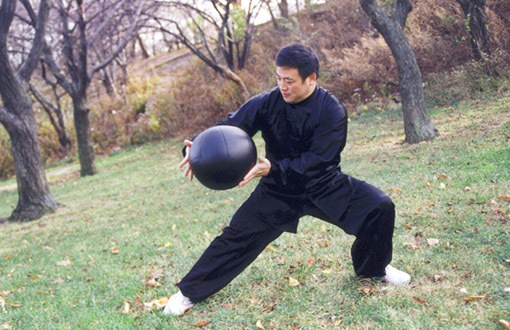 Master Feng puts great emphasis on the practice of both Qigong and Chan Szu Chin exercises to improve Form, Function, Health, and Push Hands skills. Because of the necessary terseness of the Chinese language, I thought it might be interesting to examine a few of these exercises in greater depth. I apologize in advance to my teacher, Master Zhang Xue Xin, for any errors or mistakes which are the result of my misunderstandings alone. Chan Szu Chin exercises are an excellent means of practicing Taiji principles of movement. For many of us, practicing the form alone is not the easiest way to improve our skills. In the form, we are often just finishing one movement, when we have to go on to a new and completely different movement in the form. Although there are repetitions, they are spaced away from each other and not practiced repetitively. This is where the Chan Szu Chin exercises come in. They allow us to practice basic body mechanics, which will form the basis for one or more movements contained in the form. They allow us to focus more carefully on the important principles of movement required in the Chen style. Although Chan Szu Chin exercises are found exclusively in the Chen style, other styles often accomplish the same result by repeating individual movements. By way of example, both Yang Zhenduo and the late Fu Zhongwen advocated the repetition of individual basic movements from the Yang form as a way to improve performance and to develop internal power. In addition to Chan Szu Chin exercises, the Chen form has its own supplementary power training exercise, such as twisting the short stick (for Chin Na), shaking the long staff, and rolling the Heavy Jar (for developing waist power and body connection). Master Feng’s style includes training supplements as well. Although Chan Szu Chin exercises are found exclusively in the Chen style, other styles often accomplish the same result by repeating individual movements. By way of example, both Yang Zhenduo and the late Fu Zhongwen advocated the repetition of individual basic movements from the Yang form as a way to improve performance and to develop internal power. In addition to Chan Szu Chin exercises, the Chen form has its own supplementary power training exercise, such as twisting the short stick (for Chin Na), shaking the long staff, and rolling the Heavy Jar (for developing waist power and body connection). Master Feng’s style includes training supplements as well. 10. Finger thrust and chop with waist turn. What I would like to do in this article is to go into a more complete description of three of Master Feng’s Chan Szu Chin exercises. This will give the practitioner a greater appreciation of the technical requirements of these exercises. Hopefully, the reader will even be able to practice these exercises on his or her own. They are certainly helpful regardless of style. Keep in mind that these are not just “range of motion” or “loosening up” type exercises. They will increase range of motion but in Taiji, no part of the body should move in isolation. “When one part moves, the whole body moves” is a good maxim to keep in mind. Beginners should emphasize integrated whole-body movement “led by the waist.” More advanced Chen-style practitioners should remember to keep “peng” alignment throughout and to circle each and every moveable body part in a coordinated fashion to increase “spiral” body power. I have chosen three of the easier exercises to focus on: Single Shoulder Circling (#3), double shoulder circles (#4), and Waist Turning (#24). Exercise #3 Single Shoulder Circling Purpose: The purpose of this exercise is to increase the range of motion in the shoulder and to open and close the “thoracic hinge,” which divides the chest and back along the center line (see August 1994 Tai Chi Magazine regarding the “Thoracic Hinge”). This will also aid in the ability to neutralize by rolling the shoulder and to develop the power of “kou” or shoulder smash. 1. Forward Shoulder Circle: Stance: Stand with left foot forward about the natural distance of one step. The front foot faces forward with the rear foot turned out at a 90-degree angle. This stance is like a shortened front stance. As the shoulder rolls and circles, the weight will shift forward onto the front leg and then backward onto the rear leg. The knees are kept bent and the weight of the body is kept lowered. Do not let the body stand up out of its rooted position on either leg. Compress and expand the Kua to sink and rise (see 1994 Tai Chi Magazine regarding “Pumping the Kua”). Body Movement: For the Single Shoulder Circle, there are two main variations: (1) circling upward and backward or (2) circling forward and downward. The lead shoulder is doing the circling and the rear shoulder remains back in a relatively stabilized position. The lead shoulder will be making a complete circle. After completing at least 9 repetitions with the left foot forward, change the stance and do at least 9 repetitions with the right foot forward. The important distinction between this exercise, as opposed to a simple flexibility or “range of (shoulder) motion” exercise, is that in Chan Szu Chin exercises the whole body is involved, not just the shoulder. The shoulder turning should be the result of shifting forward and backward in stance; raising and lowering the body; circling the “tantien/mingmen ball”; and opening and closing the chest and back at what could be called the “thoracic hinge.” This is not just an isolated shoulder movement. Try to involve the whole body to create the maximum shoulder circle. 4. Combinations of one, two, and three, such as diagonal or circular movements. This exercise emphasizes and strengthens the side-to-side waist-turning movements. If the sideto- side waist power is correctly manifested, then many other movements relying on this commonly used body action, contained in the Chen form, will also be improved. Not only will the body develop greater internal power, but the organs within the abdominal cavity (liver, spleen, stomach, kidneys and intestines) will benefit from this gentle waist massage. Loosening the waist also increases our ability to neutralize by turning of the waist in push hands practice. Keep your central body axis aligned vertically. Keep the “baihui,” top of head, straight and gentle, lifting upward throughout. Do not shift your hip outside the power base created by the inner arch of your legs. Form and Applications: The use of this exercise can be found in the Chen 48 Form of Master Feng: in movement #46, “Sink Waist With Elbow Down,” and also in movements #6 called “Move and Hinder with Elbow on Both Sides” in the 2nd Chen style routine, Pao Twi. The application could be to step in front of your opponent’s lead right leg with your lead right leg, so that you are facing legs at the level of shin or thigh. Block his forward hand attack with your rear left hand. Bring your lead right arm under his attacking right arm. Use your right elbow to hit his back and/or kidney area by turning your waist to the right. Besides being the recipient of an elbow strike, the opponent may be thrown over your right lead leg to the ground. As you may now see, there is a lot going on inside these Chan Szu Chin exercises. To do them all slowly, for a minimum of 9 times for each exercise, could take anywhere from 60 minutes to over an hour. This does not mean that one cannot practice individual movements separately. Each exercise has something special to offer. I have limited myself to a hopefully clear technical description of how to do a few of these easier, basic exercises. I hope you will be able to enjoy their benefits and increase your progress. Although much more could be said regarding the Taiji Principles, let me just summarize by saying this: Be sure to emphasize and to distinguish the substantial and insubstantial; circle and spiral; and the whole body integrated movement. Also, be sure to emphasize and to distinguish between opening and closing; uniting inside and outside; expanding and compressing; raising and lowering; turning left and right; advancing and retreating; maintaining “peng” alignment throughout; and, of course, staying smooth and relaxed. Good Luck!